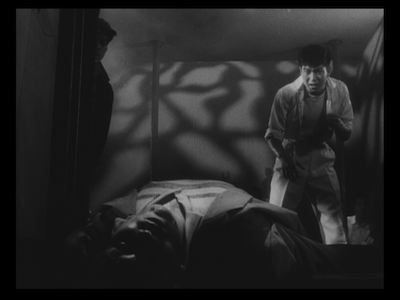 I enjoyed the recent Eclipse set The Warped World of Koreyoshi Kurahara [review] to such a degree that it only made sense to finally take the plastic off of my Nikkatsu Noir box and watch the Kurahara film included there. 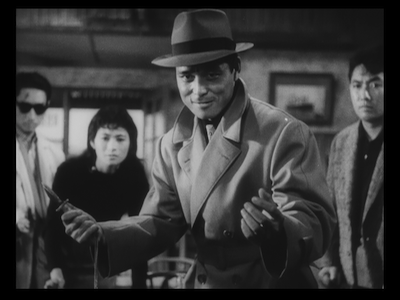 The 1957 crime drama I Am Waiting (Ore wa matteru ze) is actually the director's debut, predating the earliest film in Warped World by three years. For his first feature, it's impressively mature, showing an assured grasp of dramatic storytelling as well as the filmmaker's penchant for artistic daring. The story opens on a lonely late-night pier. A boy finds a girl standing at the edge of the water, and sensing she may do herself harm, invites her back to the pub he owns on the waterfront. He is Joji Shimaku (Yujiro Isihara), a former boxer who now runs this low-rent café while waiting for his brother to contact him and tell him their farm is set up in Brazil. She is Saeko (Mie Kitahara), a singer whose career has fallen on hard times. She ran out on a contract at a skeevy cabaret after clocking her gangster boss' grabby little brother (Ken Hatano) over the head. That she ran into Joji was good fortune for her. His bar is a place for people living on borrowed time. Everyone there is running from something and well on their way to something else. Joji stopped boxing after he killed a man in a bar fight. Another regular (Isamu Kosugi) is a doctor with a drinking problem who lost one too many patients on the operating table. The cook was once a chef on a cruise liner. This is a place where you end up, not where you begin. A relationship quietly blossoms between Joji and Saeko. She begins working as his waitress while they wait to here if she killed the man she attacked. Both of them slowly reveal their pasts, but the are tentative about their present. Neither feels comfortable settling down, and with good reason. Joji's plans to leave for South America flounder when he finds out that his brother never made it to his destination. 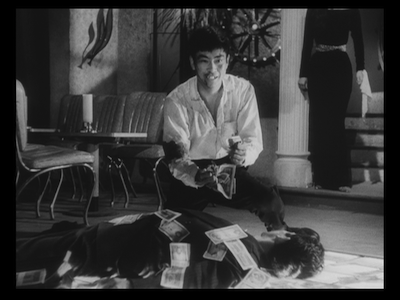 When the gang boss Shibata (Hideaki Nitani) comes looking for Saeko, he arrives like an agent of fate, dictating the paths of these young romantics. As Joji digs into the mystery of his brother's disappearance, just how intertwined all of their histories really are becomes even more clear. I Am Waiting takes place on dark, foggy side streets, down alleyways and along patches of river where most common people don't go. For a guy like Joji, it's a purgatory he would have never chosen for himself; for a predator like Shibata, it's a jungle of opportunity. As they make their way through other parts of the city, the regular people they run into--shopkeepers, waitresses, etc.--look at them with fear. Sure, Shibata's thugs are questionable characters, but it's also like Joji is cursed. His arrival, and the danger that surrounds him, is a bad omen. If you get stuck in the same plot he's stuck in, you might never get out. Music plays an important role in I Am Waiting. Masaru Sato delivers a score that brings to mind Ennio Morricone, both in its style (the whistling) and function (certain snippets act as almost humorous commentary). The bulk of the soundtrack is jazzy, leaning toward bossa nova in rhythm and percussion. It is self-consciously "criminal." The orchestration draws a contrast between two worlds. Prior to her career as a nightclub siren, Saeko was an opera singer. The brief performance we hear on the radio inspires a torrent of confession, and this juxtaposition of high and low art is meant to show how far she has fallen. 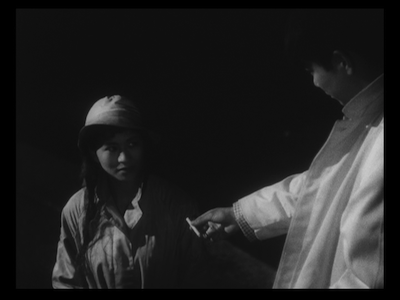 Kurahara also makes Sato's music an important part of a trio of flashbacks that dot the film. In each, we see past violence, incidents that have had tremendous impact on the lives of the movie's characters. They are shot so that the sets look purposely fake, so that these memories appear almost impressionistic. There is no dialogue or sound effects, just the beat of the music. This adds to the impact of the climactic fight in I Am Waiting. Kurahara does the opposite when Joji and Shibata have their showdown. There is no music, only the sound of their fists and their feet. 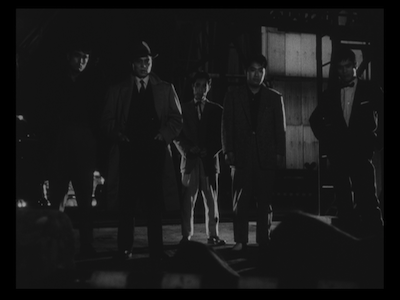 The volume is turned up, and the director uses Shibata's cavernous nightclub to exaggerate the noises. Each footfall on the dancefloor, every sock to the jaw, echoes in the empty bar, leading up to a true "money shot," one almost as effective as Kubrick's in The Killing. As is common in these kinds of stories, the showdown represents decisive action for the protagonist. Once Koji started investigating his brother's death, he had chosen to stop waiting and take his life back; the brutal throwdown between himself and Shibata serves as a kind of absolution. The fighter took himself out of the ring for no good reason, and now he is putting himself back in for a particularly righteous one. The exile is over. Yujiro Ishihara would later work with Kurahara on other features, including the irreverent romantic picture I Hate But Love. His turn in I Am Waiting comes just after his breakthrough in Crazed Fruit, and he's excellent as the brooding boxer. The actor perfectly embodies the indecisive, tortured soul of someone denying his own natural instincts and abilities. He is aided by Kurahara's almost dispassionate shooting style. 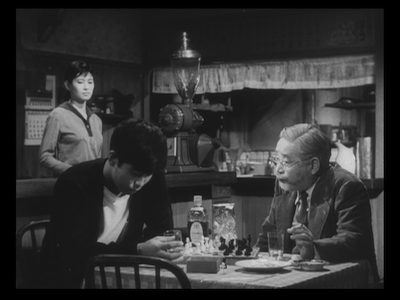 The director and his cinematographer, Kurataro Takamura, use the drab, gray spaces wisely, letting the characters move within the static environments on their own, sometimes observing from a careful distance, even peering past other objects or over someone's shoulder to examine the action. There are early indicators of Kurahara's trademark god's eye view, but he mostly stays down on the ground here, walking with the mortals as they deal with their earthly concerns. 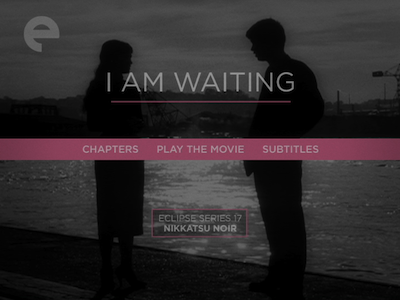 I Am Waiting is a smartly constructed, deeply emotional crime film. While film noir is often a debatable tag, and 1957 comes some time after the true period of American noir, I Am Waiting's portrayal of tortured souls trying to outrun a troubling past only to end up right in the middle of everything they intend to deny fits in with other classics of the genre. The long-reaching shadows of fate blanket everything, but one can learn to live in the darkness, provided they make the right choices. One cannot fight passively, nor can anyone love that way. As Joji learns, you can't wait for the world to realign itself once everything has gone wonky, you have to make it happen on your own.